This photograph I could not resist from clicking and then presenting to you all. 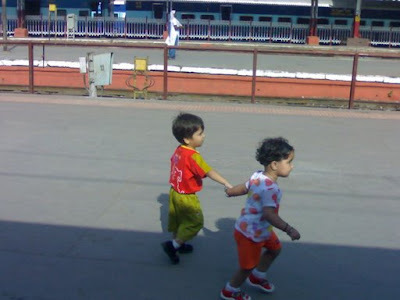 I saw these really cute kids on the railway platform of New Deli Railway station. I later learned that they were not siblings, not even relatives or children of family friends. They were unknown to each other but still were taking care of each other so warmly that I was glad that I captured the moment before their parents took them in separate directions. Yes, very nice. And even nicer that they were unknown to each other and still taking care. Good photo.